The history of Res Publica Nowa started in 1979 when a group of polish intellectuals decided to set up an independent underground journal. Since its very beginning Marcin Król has been the editor-in-chief. By 1981, eight issues of the magazine, initially called Res Publica, were published. Among the prominent contributors were Pawel Spiewak, Barbara Torunczyk, Andrzej Micewski, and Stefan Kisielewski. In 1987, Res Publica Nowa was restarted with the approval of state officials. At that time it was probably the only journal of its kind in the Soviet block. Res Publica has earned its fame for hosting forbidden intellectuals from Poland and other countries like H. Arendt, I. Berlin, M. Oakeshott, and many others, virtually unknown to the Polish reading public of the time. The magazine has also played a major role in creating the necessary political climate to make the Roundtable Negotiations possible. 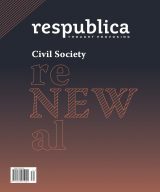 Despite all the political and personnel changes, Res Publica Nowa has managed to defend its position as an opinion-maker journal. Over the decades it has been offering articles from various disciplines including philosophy, politics, sociology, literature and arts. Today, Res Publica Nowa reappears for the fifth time in its history. After bringing up a generation of intellectuals born in the 1960s, it is now edited by a third generation of the 1980s. Together with many of its previous editors still “on board” it continues to gather a growing group of readers around the themes of culture, philosophy, society and religion. Where do you stand on Europe?